Here is a list of this year’s Food & Wine Exhibitors. Check them out online or at Celebration Weekend! 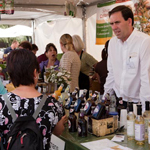 Also see our outstanding line-up of artisan food producers at our Artisan Food Pavilion!